Filtered for #lumberjacks. Back to unfiltered. The Super 5K road race Lowell, MA. #28 ultramarathoner. #19 runner. Back after 21 days. Now that's multitasking - his 0.3 treadmill miles to the tune of Gangnam style also show up here on the virtual race. Because he did his flip late in the treadmill dance, he gets extra points, just like the ice skaters got bonus at the Winter Olympics for doing jumps late in their event. Including today, 45 more days to the end of this virtual race, and I have about 91 more miles to go to complete 200 miles between Jan. 1 and April 10. If you've been in this race since last year, the quick way to figure out how many miles you've done in 2018, is to subtract what your cumulative mileage in this race was as of the last 2017 entry, from your latest cumulative mileage. You can see the cumulative mileage by clicking on the red balloon-shaped map icon to pop up the picture with cumulative miles as of that day's entry. Thanks to @TomZot for the Winter Duathlon idea, featured in the latest Facebook group post: https://www.facebook.com/gr... About to cross-country ski and either snowshoe or run afterward, as today's back-to-back duathlon event. What's your 2 sports of choice? Bright idea? Shall we have a competition within a competition? Winter Olympics about to start up, so will try to come up with something fun and announce the rules here and on Facebook. Once I hear back from @TomZot on how his Winter Duathlon works, can try to incorporate some of his ideas in the Virtual Winter Olympics! Got bored at work so everyone who logged miles in January just got a bunch of hearts xD Maybe it'll remind @Bradcrazy to come back and log! I know he's still running! Hey everyone, just noticed racery is now assigning a hashtag and number based on where you finished or your current standings in the first round - #77 runner in my case - and current standings if you're onto the second lap - #47 ultramarathoner as of this writing, in my case. Kind of fun to feel like an ultramarathoner, even if only in virtual reality! What are the little award ribbons following some of the placements? @bgizzi - think they award those ribbons for doing a streak, based on monthly stats, and updated regularly. There's also a different colored ribbon for longest run, per month, updated regularly. Hi. 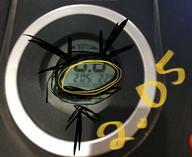 Why aren't Hipster miles adding up, and why aren't Hipster members so noted when they post new mileage? I see some people labeled at #Lumberjacks, but none as Hipsters. Here's where you can see all of team #hipster together: https://racery.com/r/cadill... The cumulative miles are since the race began on Aug. 15, but I'll be looking only at Jan. 1 - April 10 miles to judge which team wins. And if anyone is logging their miles, they can also add the hashtag #hipster during the entry, which allows that to be a filter to see who's doing what as part of that team. Looks like miles are logging again. See note from Lesley of Racery in the below message post. Anybody else having difficulty logging on and submitting miles today? We haven't seen anyone else's activity since yesterday. Not sure if on our end or racery.com? Just tried to log and got a message stating it was taking longer than usual, and to wait, it would be processed. But, then it cleared, without posting. I had the same experience as KD. Hmmm, will e-mail racery about the glitch. Thanks for the head's up, everyone! @RaceryLesley - Thanks Lesley! That explains why some racer's miles were logging, and others weren't. Looks like things working now. Thanks again! I just added myself to #lumberjack ! @LibertyPenguin - welcome to team #lumberjack ! @Hikingteacher - think you said you count yourself a #lumberjack ? Go to your virtual race bio, and edit the field that says Groups, by adding #lumberjack - then hit SAVE. Medal with buffalo plaid ribbon is optional, but if you want it, can email you. Happy hiking - snowshoveling - hallwalking - whatevering! @AOMM Count me in for the buffalo plaid ribbon to go with my #hipster hairdo! Will email you! @RangerMo and a special friend is about to join us, but not sure which team they will be on. Pardon grammatical error - should be "are about to join"! Just sent email about the $15 medal with buffalo plaid ribbon to the following: @Mamaof7Dogs @Joelle @Keefa @JillMarie63 @KDW @EclecticKim @Shellperry @FL2ME @Lishie @Coastwalker - if I'm missing anyone, or if you didn't get the email, feel free to tag me, and I can follow up. @AOMM I didn’t get the email about signing up for the buffalo plaid ribbon race too (because I’m a sucker for plaid plus I love this medal! ), can you please email me again with the details of how to sign up for the $15 ongoing-race edition? Thanks! You're officially in the ongoing race, and just emailed details about the medal with buffalo plaid ribbon. Help raise funds for Acadia National Park and Millinocket, the gateway to Baxter State Park, by participating in the virtual edition of the first-ever Maine Sea to Summit series. Earn a medal (or two) at the same time! Check out the Race Medals! Start on top of Cadillac in Acadia, the highest point on the US Atlantic coast, and the first place in the US to see the sunrise between October 7 and March 6. Then run the Mount Desert Island Marathon and Half Marathon route, and head north for the Millinocket Marathon and Half route. Finish atop Katahdin, the highest peak in Maine and the northern terminus of the Appalachian Trail. Wherever you are in the world, you can participate virtually by running or walking and logging your miles, and watch your avatar move along on a map of the 200-mile route from Cadillac to Katahdin, including the routes of the MDI and Millinocket Marathon and Half Marathon. You have until April 10th to complete the route. To ensure you cross the finish line and to take into account any mileage rounding issues, be sure to log a few extra tenths of a mile. Registration ends April 10th and your special finisher's medal(s) will be mailed within 3-4 weeks after the end of the race, if not sooner. Special pricing for registrants in the real-life 2017 MDI and Millinocket Marathon and Half Marathon. We will cross reference the real-life entrants' list and if runners don't appear then the virtual fee will be forfeited. 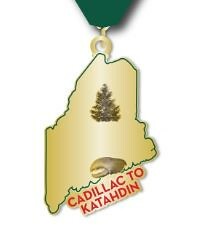 Option to add on the collector’s edition of the Acadia Centennial Medal. At least 5% of gross proceeds from the race go to help support Acadia National Park via the nonprofit Friends of Acadia, and Millinocket via the nonprofit Our Katahdin and Millinocket Memorial Library. Brought to you by acadiaonmymind.com and runmdi.org.